Can users control which job queue to use for LWEB_WSRV jobs within a Model B environment. LANSA for Web has the facility at the Web Administrator to configure the system for the Web Server. 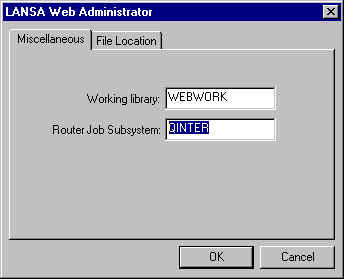 A user can specify the job queue at the "Router Job Subsystem" prompt to configure which job queue to use on LWEB_WSRV jobs for a Model B environment. To configure a Web Server, choose Web Server from the Configure System sub menu on the Tools menu from LANSA Web Administrator. Please note that the user must be signed on as QSECOFR or the partition security officer to be able to set these options. Hence, when using a multi-tiered deployment model (Model B) and if LANSA for Web Serving AS/400 has been installed, setting these options will enable the user to configure the DC@RWEB data area.